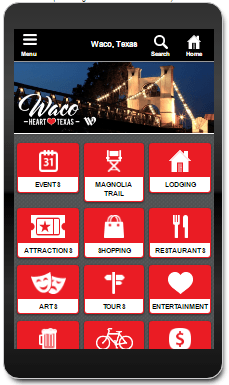 Introducing the new official Waco visitor app. It’s free to download at the Play Store and Apple Store. Once you’ve downloaded it, you will have a handy guide during your visit to Waco. It includes much of the information found on our website. Information is updated instantly as we add or change it, so it is always current. What can you do with our Mobile Town Guide? I love this app for Waco. I share it with everyone I work with. I work for TIME Manufacturing and VERSALIFT and we have about 480 employees and we have visitors coming for training classes and from other states for tours of our facilities. I show all of them this app so they can find where to eat, play and stay. I love this app also . In the Know of what is going on in our City and on a day , i may want to see what is going here, Waco, Tx i just go to my app on my phone. Yes, i also tell as many people as i can , discovering that they dont know yet also. I love this City and so does our Jesus! !